It’s been several years since “Just a Season” and it’s time to move on. Generations have come and gone, life is bearable after all, and hope lives in a little boy and in a man who almost lost all hope. It’s been said that there are no words that have not been spoken and no stories that have never been told but there are some that you cannot forget! 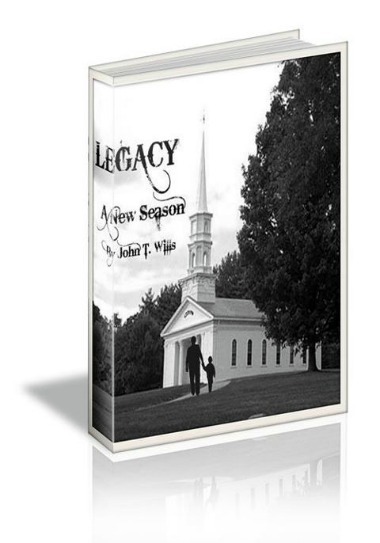 “Legacy – A New Season” is the perfect complement to that statement. It is the sequel and the continuation of “Just a Season” and a stand-alone story rich in history on a subject rarely explained to children of this generation concerning the African American struggle. This long awaited saga to the epic novel “Just a Season” will take you on an awe inspiring journey through the African American Diaspora, as told by a loving grandfather to his grandson in the oral African tradition at a time when America changed forever. If you were to reexamine the time in which you’ve lived. You will come to know that the reason we live is to die. The question then becomes what happens between the years of one’s birth and death. This is without question a quandary that each of us will face. In the novel “Just a Season”, I referred to this specific period of earthly existence as the dash that will be placed on our final marker between the beginning and end dates of life’s journey. This period of time can only be characterized as a journey because this tiny little dash represents the whole of your life. I am honored to have been chosen to channel such an epic saga. With that said, I am reminded of a powerful statement once made during a sermon by my childhood pastor – Reverend Cole. He said, “Unless and until you suffer enough pain, then and only then, will you reach deep inside and feel the breath that God has breathed into your soul coming eye to eye with your destiny”. I’ve pondered that profound statement my entire life and it continues to deeply impact my life. It could very well be because I lost my only son that I have come to embrace this message so profoundly. There have been a number of reflections from those early days at Friendly Church that continue to touch my spirit. Specifically – “Why Jesus wept?” As the story goes, Jesus was so moved as he witnessed the pain of Mary and Martha weeping for the loss of his dear friend, Lazarus, that he also wept. Today, I understand that emotion because I have felt such pain. This might explain why I was chosen as the vehicle to share such a powerful story that will surely live far beyond my season. What emerged from the pages is a legacy of true benevolence and grace that I believe is destined to be become a literary classic. This luminous story is a riveting portrait into the life of an African American man who, in the midst of pain and loss, journeys back in time to reexamine all the important people, events, circumstances, and intellectual fervor that contributed to the richness of his life. Moreover, the main character relives all of the significant events affecting the African American Diaspora, over a fifty-year period, providing a perspective of reality to the unfolding history. It’s been several years since receiving the epiphany leading me to tell the story of this man’s epic journey that many have wondered if it was a true story, miracle, a blessing, or simply a fairy tale. I will only say “Just a Season” is a must-read story that reflects the audacity of hope, pain, and struggle of a people that will most assuredly touch every emotion as you travel through time, as you relive a life through the eyes of an African American man living in America.